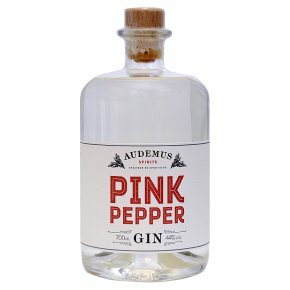 This audacious and bold gin was created by an Australian living in France. It has unique, intense flavours that will further evolve the longer it's in the bottle. Spicy notes of pepper, juniper and cardamom are balanced by softer characters of vanilla and honey. San Francisco World Spirits Competition 2017 - Double Gold.This gin owes its distinctive flavour to a daring assemblage of nine independently infused ingredients. Pink Pepper, juniper, locally sourced honey and four other botanicals are distilled separately under reduced pressure, then intricately brought together with the warmth of vanilla and tonka bean infusions. This unique process allows each ingredient to express itself individually in the glass, and their complexity on the palate will continually unfold. At once intense and spicy, yet smooth and inviting; this is a bold new twist on a classic drink. Un-chillfiltered. Will cloud when cooled or diluted.